When I envisioned this blog project, I was going to try to stick to well know spices mostly, in order to explore their potential in new ways. But I was in the supermarket the other day, and found myself staring at the spice section ticking off which spices I had and which I didn’t have. Sumac was the only spice I knew I didn’t have in my cupboard so I just had to have it! And then when I got it home, I realised I knew nothing about it or how to use or even what it tasted of. The packet unhelpfully suggested ‘add to Middle Eastern dishes’. Luckily my new cook book arrived last week and Sophie Grigson’s ‘Spices’ helped me find the potential of this unusual spice. Sumac is made of the dried berries of Rhus coriaria and used in the cuisines of the Middle East, North Africa and Sicily. It tends to be sprinkled on hummus or yogurt, added to salads and along with thyme and sesame seeds is an ingredient in za’atar seasoning used for dipping of olive oil soaked bread. Tasting it neat, it has a zing citrus like tang but no other aromatic tenancies. I was a little under whelmed tasting it but I think it is probably more suited to lovely sunny days, BBQs and salads than the rainy, windy weather we are having at present. I will do more experimentation if the weather improves and add another recipe for this spice. Stir the salt into the yogurt in its pot. Place a plastic sieve over a glass bowl and line the sieve with muslin that has been sterilised by pouring boiling water over it. Tip the yogurt into the muslin lined sieve and cover the whole lot with cling film. Place the bowl in the fridge and leave for about 24 hours so that the whey drains out of the yogurt. 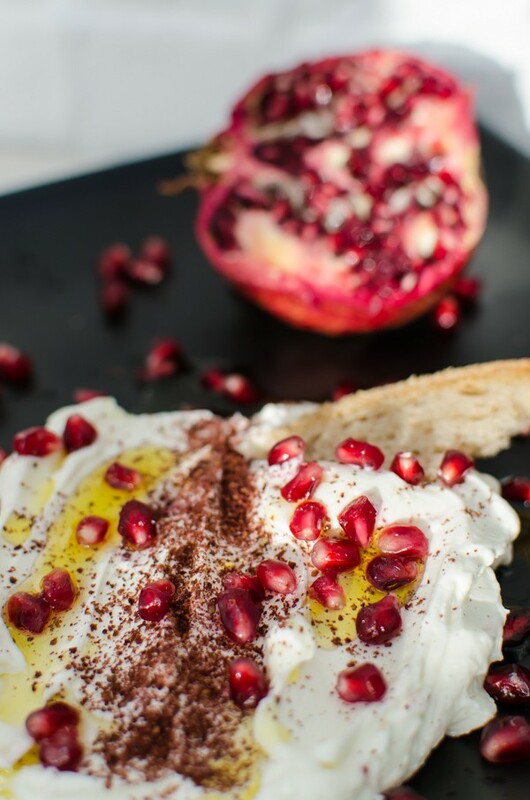 Serve the cheese sprinkled with sumac and drizzled with the olive oil. 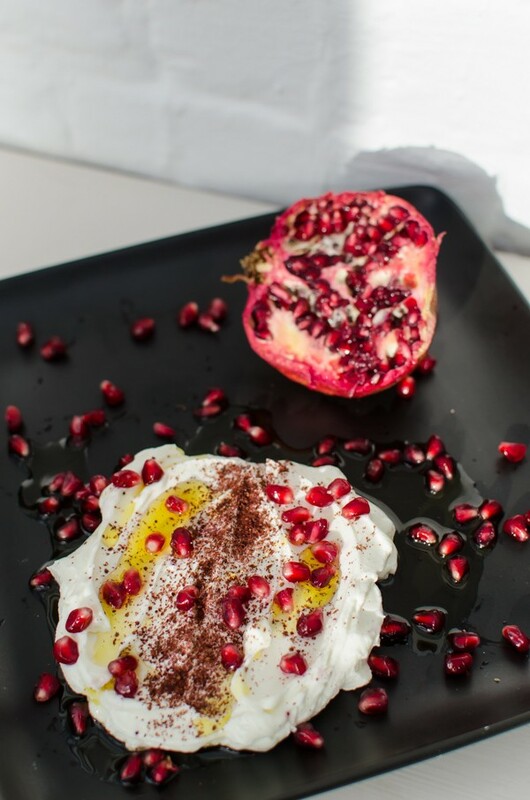 Scatter over the pomegranate seeds; the sweet burst of the seeds make a pleasing contrast to the creamy yogurt and slightly sour tang of the sumac. Eat within a day as this is a fresh cheese and does not last.